It's been a black and white kind of week so I'm combining sky watch with my black and white post. Click here for SkyWatch and here for the Weekend in Black and White. Nice shot! Enjoy your day. Hi Carver, great B&W shot.. We pretty much had the same kind of weather and some snow.. Have a happy week! It reminds me of an Edgar Allan Poe poem. Lovely black and white. If my guess is correct, you are not kidding about the black and white week. When the images in the news or on the ground are bleak, looking upward can be a real treat. Lovely trees. They look great against the sky. Autumn is over and winter is here - no doubt about it. Bare branches always look dramatic. 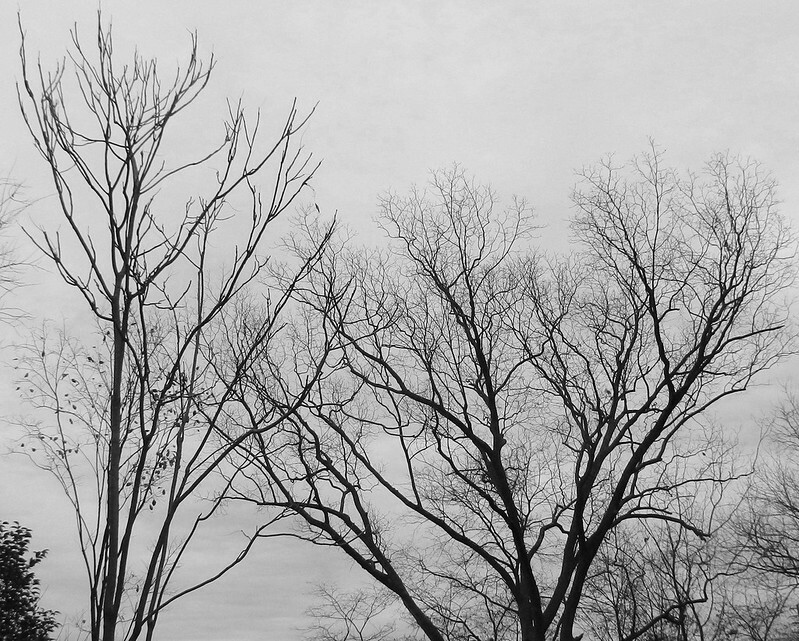 Great bw shot ~ love the lace effect of trees juxtaposed against the sky ! I love bare branches, and this a great shot, Carver!